Welcome to the Arts Market, a company designed for artistic entrepreneurs. 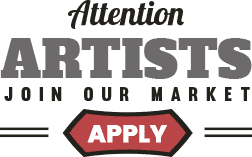 Together we can work on getting your name out there, develop advertising ideas, build networks of artists, and provide you the opportunity to create and expand your brand. Let’s see your creative side meet the business side – apply today! Rental fees are economical and have been designed for up-and-coming entrepreneurial artists to get out there without a large overhead. Spaces are $227 plus HST for 4 weeks and there is no commission, no long lease and no hidden cost! All products at the Arts Market are hand-made by locals. We strive to provide an environment that offers high quality products at competitive prices. Stall assignment is based on your needs and availability within the market. Stalls vary in size, ranging from 10 square feet to 30 square feet. We’ll find the best fit for you and let you get creative. All Sales are processed by the Arts Market staff and can be purchased with debit, credit or cash. This enables us to offer our customers a more convenient form of payment, plus we offer various types of packing and we gift wrap! Personality is everything at the Arts Market. We like our environment to be happy, friendly, inviting, and professional. Meeting the public happens whenever you come to the Arts Market. This is your opportunity to build rapport with locals and visitors alike. Creating on site is up to you! Our artists love to take advantage of weekday hours to turn their stalls into a studio/retail space. Customers love seeing creations happen so let’s create! Community Events are a great way to network with other artists and grow your business. We hold numerous vendor only and public events throughout the year that provide an opportunity for you to connect with other artisans and locals. Instagram Assistance – Let us work with you to build your confidence and skill sets within Instagram through one-one-one sessions that are tailored to your comfort level and past experiences with the app. Please use the following form to apply to become a vendor, or give us a call at 647-997-7616.